Supplements containing boswellic acids combined with glucosamine are often used to relieve the joint pain and reduce inflammation in all types of arthritis . Boswellia or Indian frankincense is one of the Ayurvedic gum resins which are referred to collectively as guggals. The gum resin extract has anti-inflammatory and analgesic properties. Boswellic acids work differently than OTC and prescription pain relievers; they deactivate the hormonal triggers for inflammation and pain related and work along the same biochemical pathways affected by glucosamine. Boswellia extracts do not seem to work as fast, or be as potent as NSAID's, at least in my personal experience, but they are potent anti-inflammatories and can be taken long term without any appreciable side effects. 1, 2 For those with chronic, long term pain who also suffer from high blood pressure, heart disease, or gastritis alternative pain relievers like boswellia are doubly important. Frankincense oil is distilled from the gum resin that oozes from incisions made in the bark of the trees. 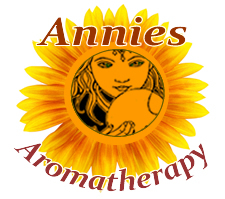 The oil is often used in massage blends for pain for its analgesic properties. Frankincense has a profound calming and grounding effect on the emotions, which can be just as important as the physical aspects of dealing with chronic pain. Preparation Methods & Dosage :Boswellia gum resins and powdered resins are diluted and used in skin care and burned as incense as meditation aids and air purifiers. Tinctures, and rarely tea, are used in internal applications. Boswellia is often available for sale in capsules. Commiphora wightii (Guggal, Guggul or Mukul myrrh tree) is most common in northern India. It prefers arid and semi-arid climates and is tolerant of poor soil. Generally leafless, the tree exudes a thick, sticky resin that has been used in Ayurvedic medicine for centuries to treat arthritis, acne, inflammation, obesity and 'blood fat'. Boswellia serrata is a close relative of the aromatic Frankincense, both contain the anti-inflammatory boswellian acid, and are astringent and anti-inflammatory. 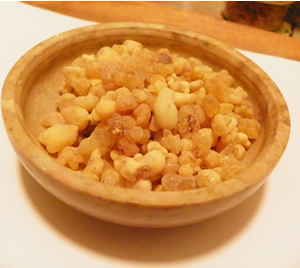 Boswellia, or Indian frankincense, is one of the Ayurvedic gum resins which are referred to collectively as guggals. 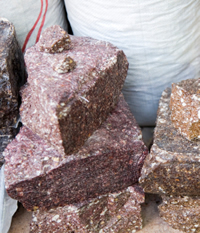 Guggals have been used traditionally to support the treatment of arthritis, ulcerative colitis, sores, and asthma. Boswellia is sometimes mixed with turmeric and another Ayurvedic remedy, ashwaganda. Since the biblical birth of Christ, frankincense, myrrh, boswellia, and other resin-releasing desert shrubs of the ancient Holy Land have been used to purify sacred spaces. In a recent 90-day, double-blind, randomized, placebo-controlled study osteoarthritis (OA) patients taking Boswellia serrata extract showed significant improvements in pain score and functional ability as early as 7 days after the start of treatment. Boswellia serrata extract exhibits potential anti-inflammatory properties by inhibiting the 5-lipoxygenase enzyme reduces pain and improves physical functioning significantly in OA patients; and it is safe for human consumption. Doses ranged from 100 mg to 250 mg daily of Boswellia serrata extract enriched with 30% 3-O-acetyl-11-keto-beta-boswellic acid (AKBA). Bell, Stacey; Balch, CNC, Phyllis A. (2012-04-03). Prescription for Herbal Healing, 2nd Edition: An Easy-to-Use A-to-Z Reference to Hundreds of Common Disorders and Their Herbal Remedies (p. 24). Penguin Group. Kindle Edition. Boswellic acids act by deactivating the triggers for inflammation and pain in joints damaged by osteoarthritis. These acids, present in extracts of boswellia species (guggals or frankincense ) alos encourage blood circulation to inflamed, painful joints.